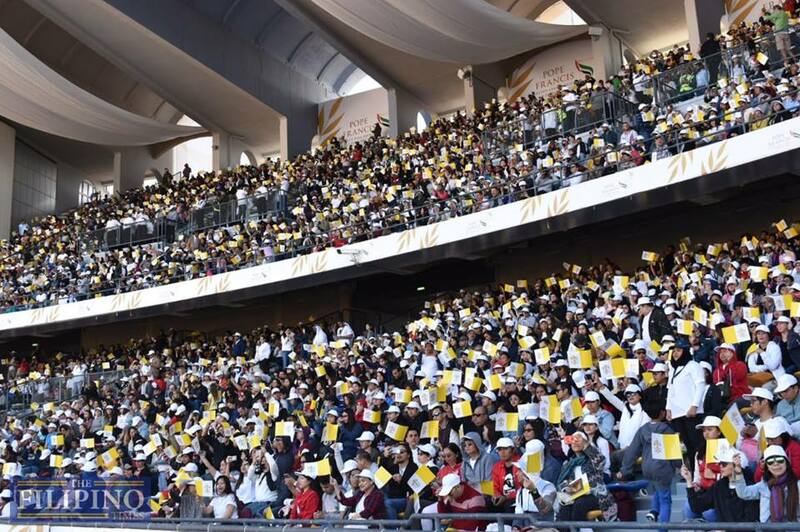 Thousands of overseas Filipino workers (OFWs) in the United Arab Emirates manifested their abundance of faith as they braved the sea of Catholic faithful who came to witness the historic Papal Mass concelebrated by His Holiness Pope Francis, Head of the Catholic Church, today, February 5, 2019. Many of them had camped out in Abu Dhabi the night before and past midnight of February 5, they trooped to the Zayed Sports City Stadium to hear the message of the Pontiff. The historic event took place in time for ‘The Year of Tolerance’ in the UAE, which emphasizes respect towards all religions, without hatred or discrimination. According to the latest estimate, the first-ever Papal Mass done in the Arabian Peninsula saw 180,000 people in attendance. The Filipinos who attended today’s Papal Mass described the event a sight to behold. The stadium became an avenue for the Catholic faithful in the Middle East, dominated by Islam religion, to observe their faith, which reflects how the UAE encourages tolerance and respect for all in the fabrics of society. The mass also saw a 120-member choir, composed mostly of Filipinos, with Filipina conductress Joy Santos who spearheaded the multi-cultural member of the choir that sang hymns in English, Arabic, and Latin. Various Filipino community leaders conveyed their deep appreciation to the UAE Government for making the Pontiff’s visit to the UAE possible, which kicked off on February 3. The visit of the Pontiff is a positive response to the invitation of His Highness Sheikh Mohammed bin Zayed Al Nahyan, Crown Prince of Abu Dhabi and Deputy Supreme Commander of the Armed Forces of the UAE together with His Eminence Dr Ahmad At-Tayyeb, Grand Imam of Al Azhar Al Sharif, who welcomed the Pope as he arrived from the Vatican. The Pope visit, she said, will not only strengthen the faith of the Catholic community but will inspire them to live with humility, compassion, and generosity. Meanwhile, Philippine Ambassador to the Holy See, Grace Relucio Princesa, who also served as the Philippine ambassador to the UAE from 2009 to 2015, shared that Pope Francis loves being called Lolo Kiko. “We call him Lolo Kiko. He loves the name. When we say Lolo Kiko, he knows we’re from the Philippines,” Princesa said in a voice message that The Filipino Times got hold of from Vatican News. “Some of my Filipino friends texted me. They were quick on the internet saying, ‘The Pope is coming, we’re ecstatic!” Princesa said, adding that the Pope’s visit to the UAE is a testament of the country as a place of tolerance. “This visit is epochal, the first-ever visit of a Pope (to the Arabian Peninsula) and it comes at a moment when the world needs to see different faiths believing in the commonality of our humanity – of human dignity. That’s what this visit personifies,” she said. The Philippines remains to be the bastion of Christianity in Asia. More than 86 million Filipinos, which accounts for 93 percent of a total population of 93.3 million, are Catholics, making it the third largest Catholic country in the world. The Holy See’s visit is definitely a boost for Catholic faithful in the UAE, and a personal encounter with His Holiness is a memory that an overseas Filipina worker will have for the rest of her life. OFW Sally Mallari cried when she was given an opportunity to meet Pope Francis in Abu Dhabi, February 4. As seen in a video uploaded on Facebook, Mallari cannot contain her tears as cleric members tell her not to cry when she found out that she was going to meet the Pope. His Holiness, along with his aide, can be seen walking towards her and the Filipina timidly approaches the Pontiff. Then, Mallari kisses the hand of His Holiness to pay respect. 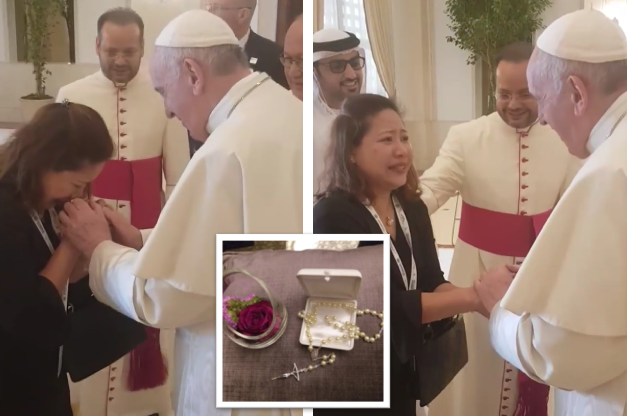 A few hours after her encounter with the Holy See, Mallari posted on Facebook a rosary that was personally given to her by the Pope. 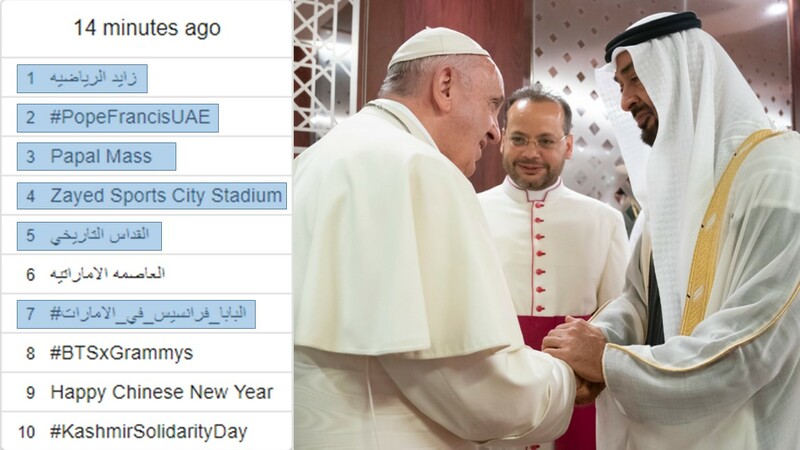 Pope Francis’ historic visit to the UAE also took over the Twitterverse as six out of 10 trending topics talk about the pontiff on the social media site. As of press time, the hashtag #PopeFrancisUAE is the second trending topic on Twitter in the UAE, while Papal Mass is in the third spot. The topics Historical Liturgy and Pope Francis in the Emirates are also among the trending topics placing fifth and seventh, respectively. Pope Francis is also among the Top 10 trending topics on Twitter in the UAE in the last 24 hours. The Papal Visit marks the 1st visit of a Pope to the MENA region. Themed ‘Make Me a Channel of Your Peace’, the visit is a positive response of the pontiff and the Vatican to the invitation of His Highness Sheikh Mohammed bin Zayed Al Nahyan, Crown Prince of Abu Dhabi and Deputy Supreme Commander of the Armed Forces of the UAE. 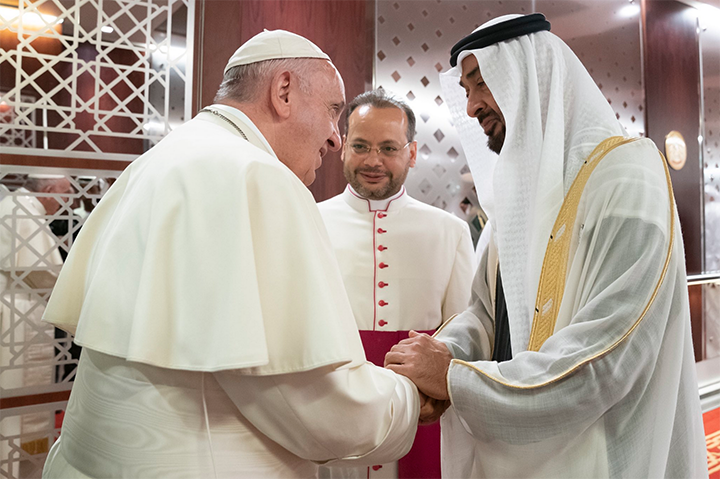 On Feb. 5, Pope Francis had a shout out to the world, and it was a series of photos showing the tolerance of faith and religion that the UAE observes among the more than 200 nationalities that work and live in the country. In his own Instagram account, Pope Francis showed some of the highlights of his eventful visit. “God is with those who seek peace. From heaven He blesses every step which, on this path, is accomplished,” the Holy See captioned the photos.